Maybe I should stop linking these, so as not to spoil the game too much. 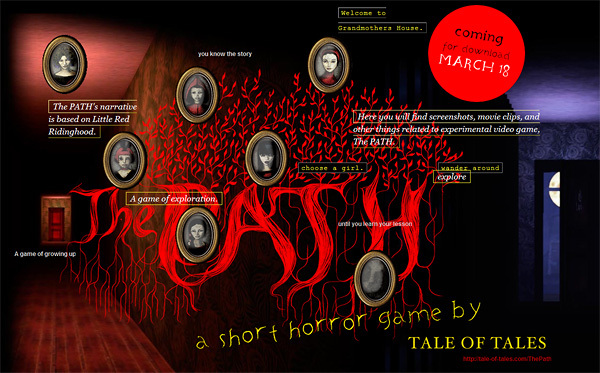 But I couldn’t help but be charmed by Jenni Lada’s little preview of The Path on Gamertell. If only because she shows how to play the game: by making up a story as you go along. Achim Fehrenbach has turned a telephone interview into a nice article and got it published in both Zoomer and Der Tagesspiegel. It’s about The Path, but also about some of our other projects. In German. Hopefully this helps getting the word out in the German speaking world. Jarboe and Kris Force have created the first track of what we hope will become The Original Soundtrack of The Path, simply entitled Safe Song. You can listen to it here or download it here. I say “created” because in the game, the music is completely dynamic and never the same twice. So this linear song is only an approximation of the experience of the music in the game. A distillation of its perfume. Like a blossom picked from a tree. and the Red Girls interview her! Chris Bateman is the designer behind Discworld Noir, Ghost Master, Heretic Kingdoms: The Inquisition and many others (videogames as well as board games). With the exception of the independently developed Play with Fire, he works mostly as a designer “pur sang” in the sense that he seldom initiates a project or comes up with the basic themes for a game but instead works in a much more applied fashion, like a furniture designer would or a fashion designer. We hired him ourselves in that capacity when we were working on “8” and he did a spectacular job, saving us from having to design the actual gameplay ourselves (which, as you may know, is something we detest 😉 ). That being said, by now, Mr. Bateman is probably much better known as a provocative games theorist, philosopher and even economic analyst on his fascinating blog Only a Game. He’s currently finishing up his second book on game design. But it is reading his first book “21st Century Game Design” that prompted this interview. In this book Chris Bateman and Richard Boon map the play behaviour of different people to their psychological profiles and come to the conclusion that different people play in different ways. As logical as this may sound, it is one of the most ignored aspects of the medium in the videogames industry. So much so that one company who recognized this was able to outclass and outsell two other companies while they were comparing the size of their consoles and with products that were technically inferior. That company was Nintendo and the success of its strategy was predicted by Mr Chris Bateman.